This farm sits in the hills above the town of Uvita and boasts views of the surrounding mountains, the Pacific Ocean, and a spectacular waterfall! It is aprox a 25 min drive down to the beach and 40 min drive into the city of San Isidro. The higher elevations are great for growing fruits and vegetables and are much cooler than down at the beach. 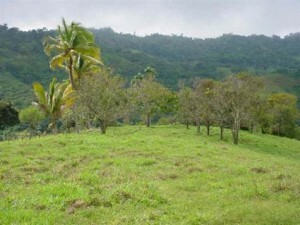 The upper part of the farm has a large flat area perfect for several homes and cabinas. The rest of the farm drops away which gives it the great views. There is a trail that takes you down to the river which has amazing waterfalls and swimming holes. Weather you are looking for a hobby farm or a private estate you should not miss this one!